There was a knowing quality to Spielberg’s original Jurassic Park. The title and logo are shared between the park and the film. The park’s merchandise can be bought in real-life. When Dr Grant and Dr Sattler see the brachiosaurus for the first time, their sense of awe relates to that of the audience, seeing the incredible CGI for the first time. It’s hard not to see John Hammond’s ecstatic ‘welcome to Jurassic Park’ as coming from Spielberg himself; indeed Hammond is Spielberg, the showman, and it’s telling how much more sympathetic Spielberg’s Hammond is compared to Michael Crichton’s. Jurassic Park was a blockbuster about blockbusters; the production of the dinosaurs a metaphor for the production of the CGI, the sense of wonder felt by the characters shared with the audience. But that was 1993. In 2015, CGI is everywhere – it doesn’t wow anymore. Blockbusters are constantly having to up the stakes. Now, blockbusters end with superheroes fighting on floating cities in the sky. Jurassic World has adapted too – whereas the first film took 20 minutes to build up to its dinosaur, Jurassic World throws them out in minutes – hundreds of them, paraded before bored crowds. The shot of a T-rex, chomping down on a goat off-screen whilst characters nonchalantly text – is very telling. 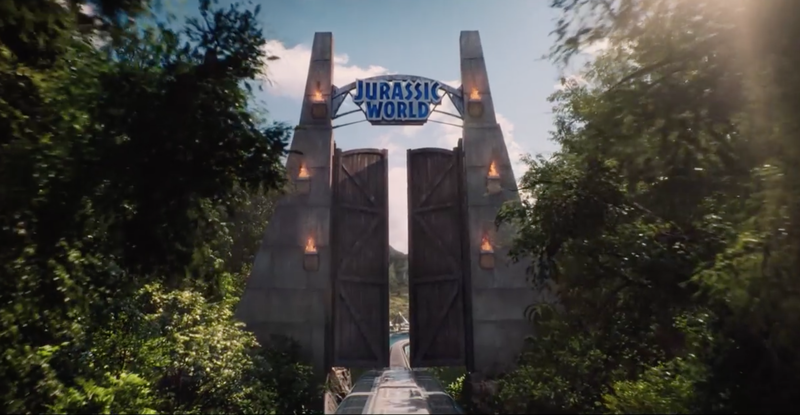 There’s almost a sense of self-parody to Jurassic World – corporate logos are everywhere, real product placement in a film about corporate greed, and the bulk of the plot consists of the team creating a scary new, utterly infeasible, dinosaur, to draw in the crowds. Spielberg was the showman – Trevorrow almost the parodist, and Jurassic World reflects the state of the modern blockbuster, which always needs to be bigger, louder, crazier. Kids these days don’t want to wait 20 minutes to see the first dinosaur. It’s a clever take for a movie with this much money behind it, if in a way, a little depressing too, making assumptions about modern movie going audiences being well, stupider. It’s hard to judge how much of this is the tail wagging the dog – are attention spans limited because the studios expect them to be? The film essentially ignores the two previous sequels, picking up some twenty years after the first movie with a fully-functioning and successful Jurassic Park operating on Isla Nublar. Hammond’s dream has been realised, it seems, but attendance at the park is falling; dinosaurs have become mainstream and they don’t pull the crowds like they used to. Having learnt nothing apparently from the first park, the investors push for more, which leads the park’s creators to put something a little scarier together – the Indominus rex – a monstrous thing pieced together genetically from several separate beasts, designed specifically to boost guest attendance. But this being a Jurassic Park movie, things don’t go smoothly – the Indominus escapes, causing chaos for everyone – including the park’s operations manager Claire Dearing (Bryce Dallas Howard). Clare’s two nephews (Nick Robinson, Ty Simpkins) also happening to be visiting the day the beast gets loose, and raptor wrangler Owen Grady (Chris Pratt) is called in to help. On the side-lines, shifty InGen employees (led by Vincent D’Onofrio) make their play for the park’s monsters. The spirit of Ian Malcolm hangs over the park, and chaos theory reigns. Jurassic World does pale compared to the original though. The original, whilst slower, had a considerable amount of craft behind it – Spielberg, Stan Winston, John Williams – at their most confident. It was an awe-inspiring action-horror adventure, and holds up so well today. Jurassic World, whilst clearly made with considerable enthusiasm by Trevorrow and fun to watch, has nothing to rival the t-rex attack, or the raptors in the kitchen. There’s much less tension here, and a sake of things being destroyed for the hell of it. When people died in the original film, it was important, but there’s none of that here. The extended CGI in a way hurts the movie too – there’s no restraint, and as such, the filmmakers get lazy. Sequences involving the aquatic mosasaur for example, are going to be CGI and the creature does look good – but then factor in that the water is CGI too, and the backgrounds surrounding it – this sense of weightless reality makes the film feel at times like a video game, hints of the Star Wars prequels. Jurassic Park mainly used animatronics and puppets, which always look more solid, and as such, the visual effects of that movie remain strong, whereas there’s a fakeness to Jurassic World, which should have taken a page from the more-restrained recent Godzilla movie – a similar and more successful monster movie update. The problems with Jurassic World probably stem from its development. The film spent a long time in development hell, going through several different drafts and writers – including insanity such as trained dinosaurs with guns, and genetically engineered dinosaur/human hybrids. The final concept the movie lands on is strong, but you get a sense that a lot of the plot and sequences have been cobbled together from separate places and there’s a real lack of unity. The raptors, so scary in the original movie, are here silly and stretch the movie’s already thin credibility by becoming some sort of trained task-force. The InGen motives are muddled and there’s a lazy, ‘fix it in the sequel’ quality to them. Returning character Dr Henry Wu (B.D. Wong) is inexplicably shifty this time, and his motivations seem to have come from a different character. The Indominus rex has the ability to camouflage itself – a trait it uses just once, which makes you wonder why even include it. Characters don’t really need to be developed in this sort of movie but they seem to be all over the place here, and noone is memorable. The two kids, directly included because it happened in the original film, at one point mention their parent’s divorce, which is then never mentioned again. There’s also a problem that noone – the kids especially – ever seems to act frightened, or particularly bothered when people get eaten. There’s never a sense of danger, and the first film has so much more gravitas in comparison. Some elements – the mosasaur, the gyro-spheres – seem to have been included because they look cool, or worse, reverse engineered with the set-pieces in mind. A lot of this narrative reflects that. Characters make stupid decisions to further the plot – when the Indominus rex apparently escapes its cage, characters go in to investigate – this is explained away with the creature’s secret attributes, but it’s a stretch, and makes you wonder how this park has remained open for as long as it has – worse, the scene is so obvious in its construction and so forced, it makes the audience very aware they’re watching a movie. That never happened in the original, which felt considerably more organic than this movie. In this film, you can see all the strings. A lot of decisions here seem to stem from separate drafts or focus groups trying to figure out what the audience wants (which worked – Jurassic World has had the biggest opening weekend in movie history) but the result is the film feel’s a bit transparent. The film also has to contort itself in narrative knots to release further dinosaurs and keep the characters in danger, and the climax is massively rushed, silly, and fuelled by fan-service. This review has been overwhelmingly negative, perhaps a result of high expectations following a beloved childhood classic. Jurassic World is not a bad film. It’s a lot of fun to watch in the cinema. The opening hour especially is quite strong – the new park is fantastic to see, and the opening tours of the exhibits and shows is very exciting. There’s a sense watching these scenes where you feel like a child again, and that’s wonderful – when that John Williams score (sadly underused) swells up, you really do travel back in time. At these moments, the film is perfect. Trevorrow knows his audience and the film is peppered with references to the first film, and these are great for fans. World building is fantastic and we get a sense of the park quickly. There are references to Spielberg’s career as a whole – a dying dinosaur which looks like ET, a death which borrows from the opening of Jaws – and the movie feels like a direct sequel to Jurassic Park – there are so many nods and nostalgia runs rampant. There are some fantastically tight sequences and the movie manages at times to be really suspenseful – the Indominus escape despite flaws is thrilling to watch, as is the attack on the gyro-sphere, and when the flying dinosaurs get the sense of escalating chaos is exciting. All of the action sequences are decent, and some of the quieter moments work too – the dying ET dinosaur is more powerful than it has any right to be. It is fun being back in this world, and kids will absolutely love the film. The characters may be weak, but the actors are great, and Pratt and Howard are good with nice chemistry together. It’s the funniest Jurassic Park movie – there’s a lot of great lines for laughs. It’s also much better than The Lost World, and Jurassic Park III. It’s mainly the last half hour of the film that hurts it – everything just starts to get too silly, too rushed, and the way the script seems cobbled together. That’s not to say there isn’t a lot of great moments before we get there though. There’s a sense this is for a younger audience, or perhaps the blockbuster DNA is too different now – this has been described as Marvel’s Jurassic Park, which is a good fit for it. Perhaps a reminder that you may have grown up more than anything, this is a fun summer movie with a fair few flaws. Fans will be happy, and it’s worth going to see, just don’t expect Spielberg. Tags: action, blockbusters, chris pratt, cinema, cinematography, dinosaurs, film, Film Review, jurassic park, Jurassic world, monster movie, monsters, nostalgia, spielberg. Bookmark the permalink.